Kim and Mauborgne are strategy and management professors at INSEAD. They have a very compelling take on strategy. They use the examples of red oceans and blue oceans to make their point. Red oceans are markets where “industry boundaries are defined and accepted, and the competitive rules of the game are known.” Companies fight for share in these markets by taking blood from the competition, creating a red ocean. Blue oceans, in contrast, are unknown, “untapped market space,” where “competition is irrelevant because the rules of the game are waiting to be set.” Companies like Cirque du Soleil have found blue oceans and the profits and growth are voluminous. That’s good stuff, I like the visual. Here is a picture that I’ve drawn to give you a big picture view of concepts and content…they want to take you from red oceans to blue oceans – from the bottom to the top. They describe a systematic method to discover blue ocean opportunities and bring them to fruition. They introduce a host of graphs, matrices, charts, and tools to help you frame your quest for blue oceans. I like their take and I like they way the book is organized. The meat of this book is Part Two, the four chapters on formulating the strategy. They back everything up with solid, real-world examples and really make it feel like you can put together a blue ocean strategy in your industry, with the team you have in place, without a lot of extra resources. However, I think the two chapters on executing blue ocean strategy in Part Three are weak. Their whole take on execution does not seem to fit and feels like a retread of current management practice. For example, they bring up the decrease in crime during the 90’s in NYC to illustrate how to execute. They use it as an example of “overcoming organizational hurdles” and refer to it as an example of “tipping point leadership.” (Don’t worry, they give Malcolm Gladwell, writer of The Tipping Point, credit.) Ever since reading Freakonomics though, I can’t read another recounting of that example of great police work without smiling. 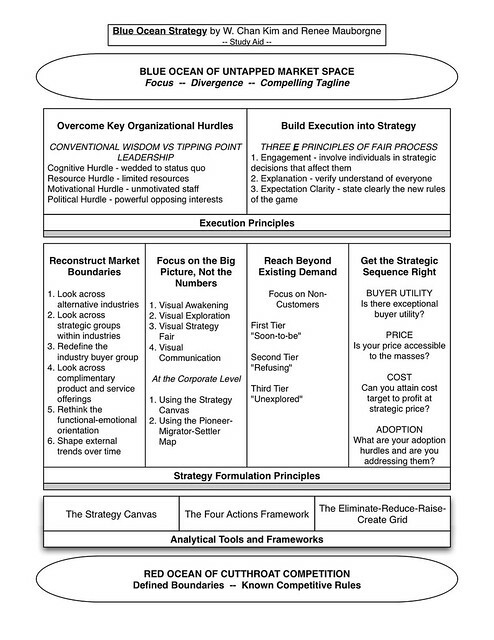 Their take on execution (management) just does not feel as groundbreaking or innovative as their take on formulation (marketing and strategy). So think of this as a marketing and strategy book, and you will not be disappointed. Posted in books, tagged business, marketing on 2006/04/19 by John.